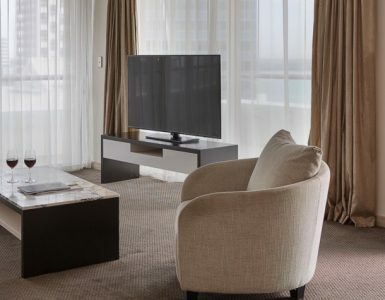 Gaze over the panoramic views of Rangitoto and Waitemata Harbour at the Pullman Auckland Penthouse. With two spacious and splendid en-suite rooms, open plan living space, dining area and fully equipped kitchen, the Penthouse is ideal for both business and leisure. Be welcomed with flowers, indulge on champagne & chocolates, savour a premium fruit platter and privileged access to executive floor. This room offers the possibility to interconnect with a private en-suite.